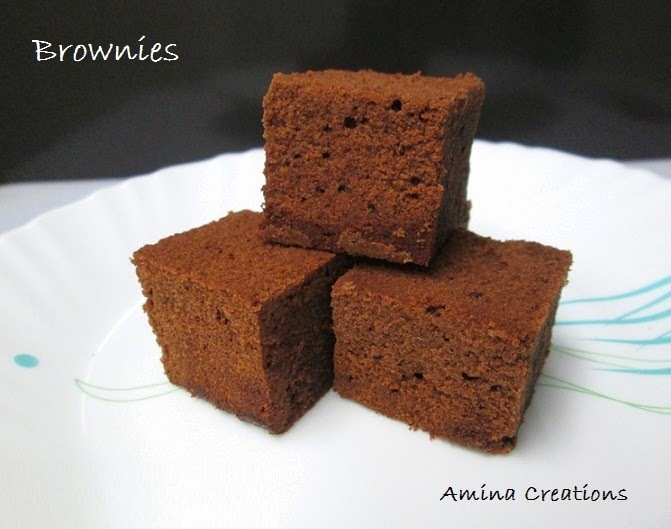 Brownies are small squares made of chocolate and usually served with vanilla ice cream or with milk or coffee. Depending on the density, there are two types of brownies, cakey and fudgy. The recipe given here is of the cakey brownie which has the perfect blend of chocolate and sugar. I have kept it plain, but you can also add walnuts, dried fruits or chocolate chips, and top it with powdered sugar or cream frosting. Keep the butter outside the refrigerator for a few hours till it is soft but has not melted. Keep the eggs too outside the refrigerator so that it comes to room temperature. Grind the sugar to a fine powder and keep ready. Sieve cocoa powder and All purpose flour twice and keep ready. Grease a square aluminium cake tin with butter and dust it evenly with flour. Preheat oven at 170 degree Celsius for 10 minutes. Now add the flour mix and gently fold such that all ingredients are well combined and you get a thick batter. By this time the oven would have got preheated. Transfer the cake mix to the greased aluminium tray and place it in the central rack of the oven with the lower rods ON. Bake for 25 to 30 minutes at 170 degree Celsius or till a skewer inserted comes out clean. Allow it to cool down and cut into small squares. Serve hot with Vanilla ice cream and Enjoy!! These brownies look delicious Amina... I want some now !! !